Way back in the olden days... before SCS and the world of stamping blogs, it was a real chore to find honest to goodness Stampin' Up! card samples on the web. There were a few dedicated galleries like Nutt'N'Honey and Patstamps, but they were few and far between. 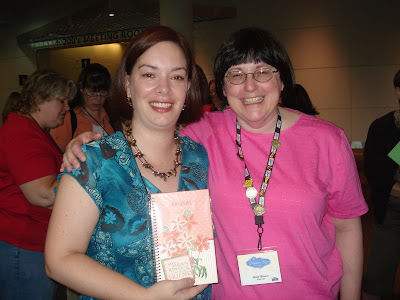 When the stampinup.net demonstrator websites first came available in the fall of 2002, I remember compiling a list of all the ones I could find, just so I could look at their art galleries on a regular basis for extra inspiration. I would save all these samples to my hard drive, make CD's, all that fun stuff. One name really stood out to me right from the beginning, and it's a simple enough one but loaded full of stamping talent. Say it with me now.. Mary Brown. Mary's artwork really appealed to me and the more I saw of it, the more I liked. SU obviously loved her stuff too since it was often showcased on the display boards at Regionals, Convention & on Stampers Showcase. She had the greated little "Cute As a Bug" series of cards that tickled me big time. Anyhoo, I finally met her in person at the 2005 Convention in SLC and it was a HUGE moment for me. She was SOOOO nice, and SOOOO kind, and didn't seem to mind my stalker-like mentality. Imagine my utter thrill when on the very first day of Convention this year, the very first morning I walk in to the Convention Centre to line up for Memento Mall, but practically the first face I saw was Mary's!!! 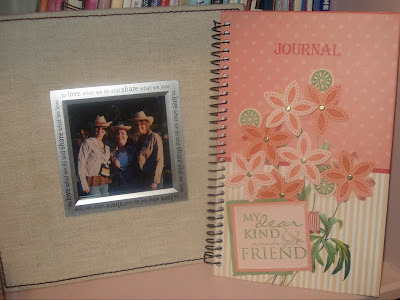 And to make it crazier, she pulled out this awesome journal she'd made and gave it to me. TO ME! If it looks like I have tears in my eyes in this picture, well that's because I did. I felt like a million bucks!! Since Convention ended, I've had this journal up on display in my studio and I've had numerous people "ooh and "ahh" over it. Ladies, I'm sorry to say the journal is being retired from public life and won't be around for you to look at it anymore. Instead, I'm adopting this as my "Founder's Circle" journal so I can bring it to Arizona next week as I write down my thoughts and observations, plus all the great info from the Business Share night. I can't think of anything nicer to bring with me than a piece made by this remarkable stamper. So Mary Brown, I thank you from the bottom of my heart, you "dear kind and wonderful friend", you! Ahhh! I have those same wonderful feelings for Mary Brown, thoughI have never met her. She was the first SU demo that I found on the web that just inspired me SOOO much! I am still in awe whenever I get to see her work. Thanks for leading me to her blog! I didn't know she had one, otherwise, I would've "been there" a long time ago!